Milly Zantow falls into the category of People You’ve Never Heard of Who Have Changed the World. In this case, the world of recycling. Because Milly Zantow is the person who created a tiny thing called the global recycling standard for plastic, more commonly known as the-numbers-inside-those-little-triangles-on-your-water-bottles-and-stuff. It’s what made plastic recycling possible. But it’s the HOW this all came about that’s jaw dropping. 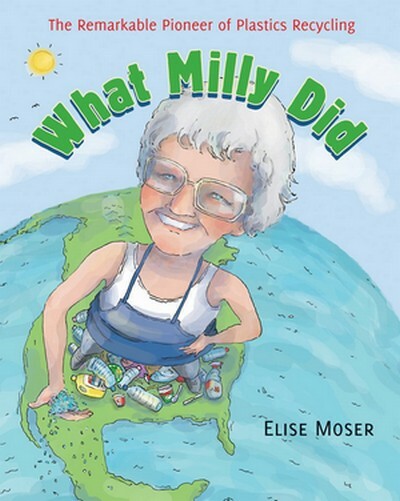 What Milly Did (a childrens’ book for all ages, including adults in my opinion) by Elise Moser, is an extraordinary story about a woman who, at age sixty or so, decides to do something about the growing problem of plastic in landfills. Turns out that plastic wasn’t recycled because no one thought it could be done. Enter Milly, an ordinary woman, raised on a farm, who has no experience in anything even remotely related to anything to do with recycling but who just really believes that something can be done. So she says pfffft to the naysayers and starts reading about plastic; she studies it, takes courses, learns everything she can then cashes in her life insurance policy, buys a gigantic grinding machine and opens a company called E-Z Recycling where she and a few others do much of the grunt work by hand, seven days a week. Moser captures Milly’s spirit as a woman who is in no way ego driven. Nor is becoming rich her motivation; she simply wants to make sense of trash and to that end she does whatever she can to help people recycle, including establishing programs in nearby towns. Eventually her vision catches on. Various community groups form, tipping fees for landfill sites are established and in 1988 her system for grading plastic is adopted by the Society of Plastics Industry, which means a standardized recycling practice across North America. The story, of course, isn’t quite that simple. There are many hurdles along the way, people who laugh, who say that what she’s proposing is impossible, and then there are the times themselves, the 1970’s and early 80’s, which aren’t overly receptive, or even friendly, to the idea of recycling. Moser has done an excellent job of telling Milly’s story against this back drop of time and place. A clever addition to the story are sidebars throughout the book, telling about bridges and boats made of plastic bottles, stats on current plastic usage and where it all goes, yo-yo trivia!, the ABCs of modern recycling, innovations in biodegradable plastic… all bite-sized, very readable for any age, and all to the accompaniment of sweet b&w illustrations by Scott Ritchie. That this is such an unknown story is mind-boggling. I’m grateful to Elise Moser for telling it. It needs to be shared. I hope the book will find its ways to schools and to homes, not only as an eye-opener to an important piece of history, but to open at least two kinds of conversation… One, about the problem of a planet full of garbage and, two, the power we have as individuals to make the world better. Or that the difficulties she faced were someone else’s fault. She just got on with it. The world could use more Milly. Great review! You’re right, the world definitely could use more Milly. I love an inspiring story. Thanks for reading! Amazing! I had no idea. Yay, Milly! And yay, Elise Moser for telling us about Milly.